How would you like to generate instant, qualified leads without using cold calling? Your answer lies in using Google Adwords Call Extensions. The largest challenge facing any sales force when making cold calls is knowing whom to speak to and if that person would have interest in the products you have to offer. Getting instant phone leads answers both of those questions immediately and is a huge win for any company. The second challenge facing any company engaging in online sales with traditional Search Only Ads is the attrition rate of the users. Typically, with standard Search Only Ads, the user has to engage in more steps to speak with a qualified sales person than with Call-Only Ads. With any website traffic, the more steps involved the more people you lose from step to step. In September of 2015, Google announced that Mobile Searches had exceeded Desktop Searches for the first time in recorded Internet history. 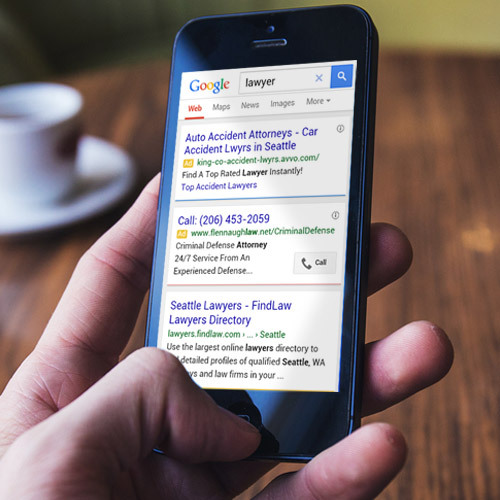 In a stunning figure, Search Engine Land announced 80% of mobile searches convert to actual leads. These numbers are huge when considering your strategies for Paid and Organic traffic generation. The following tips will help you build better Call-Only Ad Campaigns and convert more qualified leads than using traditional Search Only Ads. Use a Google Forwarding Number to track each call along with time on the phone and other important metrics. Schedule your Call-Only Ads to run only during actual business hours when a sales person is available to take the call. Sync all your call data with your remarketing data for more effective retargeting based on your Search and Display Ads. Keep your keywords relevant to your ads and use callouts that will elicit qualified leads as part of your overall messaging. Always track your metrics data to make the best possible decisions about bidding, funnels and conversions.